While some homeowners will attempt to remove the textured ceiling on their own, there can be some hidden dangers such as asbestos. If you watch any of the popular home improvement shows on television, you definitely know one thing: “Popcorn” ceilings are out. Way out. While some homeowners will attempt to remove the textured ceiling on their own, there can be some hidden dangers such as asbestos. Therefore, it’s always best to consult a professional before attempting any such do-it-yourself projects. • Do a scape test. Before prepping the room, you may want to try scrapping a small area to determine if the texture can be removed dry. Some texture can be removed without wetting it but most often applying water softens the texture, making it easier to remove. • Prep for the mess. Cover your floors with drop clothes or plastic. Also cover the walls, unless you plan to paint them when the ceiling job is complete. The plastic will help with clean up by containing the dust when you sand later in the process. • Remove as much furniture from the room as possible. Also remove ceiling fixtures and fans. Cover recessed lighting to prevent water spray from entering. • Wet the ceiling. Apply warm water to the ceiling using a pump or other spraying device. Wait about 10 minutes before attempting to remove any texture. If after 10 minutes the texture has not loosened, apply another coat of water. If the texture has been previously painted or the texture solution was mixed with paint, dry scrapping first may help the water penetrate. In some cases, painted ceilings need to be entirely dry scraped. Note that if ceiling texture cannot be removed, installing drywall over the existing ceiling is an option. • To remove the texture, work in 3 x 3 sections of a large area after you have wetted the texture. Use a drywall knife to scape the textured ceiling. Note that you should check the drywall knife’s corners to prevent gouging of the ceiling. Using a metal drywall pan to catch the falling texture can save hours on clean up. Once you have removed all of the texture, let the area dry for two to three hours before sanding. • Now it’s time to finish and repair the drywall. Unfortunately, drywall underneath ceiling texture is often unfinished and needs an additional one to two coats in order to provide a smooth surface for primer and paint. Repair any damaged joint tape and nail holes. Determine what primer and paint to use and apply. • Depending on the discoloration in the ceiling, an oil-based primer may be required to prevent yellowing and discoloration from showing through the final coat. Try a small area and wait 12 hours. If no discoloration is present, it is unlikely it will occur. After priming is complete, apply two coats of water-based paint. If that sounds a little daunting, leave the project to an experienced professional. For more information, visit www.paintingbyrobertson.com or contact Tom Robertson at 674-1510 or paintingbyrobertson@gmail.com. 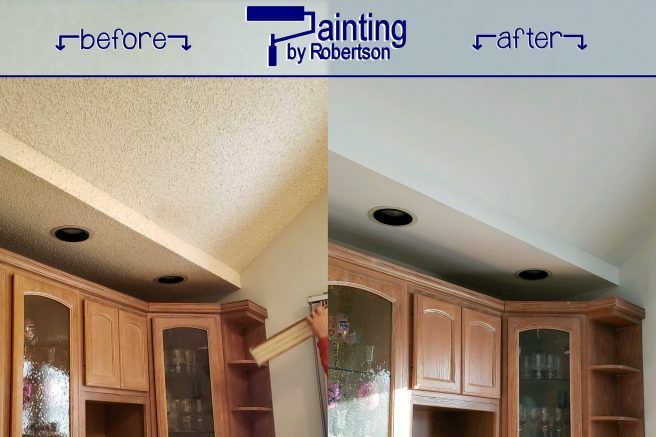 Be the first to comment on "Removing a ‘popcorn’ ceiling? Protect yourself and your property"